In 1991 we took the first step towards creating a new world, a world where our virtual and real lives converged through a community of people, histories, tactics, strategies, convenings, and software. Our efforts created a network of thousands of people and produced hundreds of exhibitions and events, buffering endless hours of media, activity, and action. We’ve spent this time building alternative spaces, and experimental cultural centers like the Co-Prosperity Sphere. 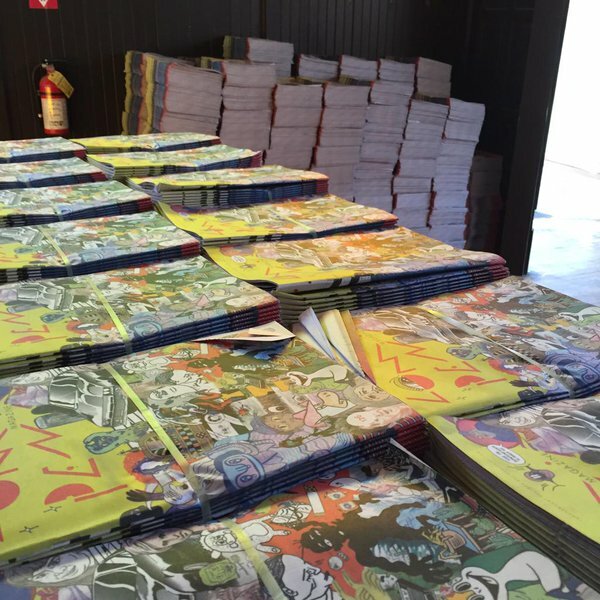 We’ve produced freakouts and happenings, and art convergences like Version Festival, and published almost two hundred issues of publications like Lumpen, Proximity, Materiel, Mash Tun and more. This year we will launch Lumpen Radio, a new FM radio station in Chicago. And everything we do is all your fault. We do this because we believe. We believe it’s possible to confront mediocrity and combat the homogenization and commodification of everyday life. We do it because we want to live in a world where heretical ideas, experimental culture, and progressive ideals collide to reset our imbalances, to inspire further assaults on unreason. But in these critical and dangerous times we forget. We forget what can happen when we celebrate and ferment the ideas that pierce the veil of hegemony, lies, and control. We forget what happens when we merely get together, plan, and act. We forget that we have participated in so many acts of defiance and liberation, because an Age of ADD has overcome the collective Sense of Possibility. That is why we have created the Lumpen Dark Web. It is an inventory of the projects, ideas, and efforts of our comrades and conspirators who have contributed to the Lumpen, Version Festival, Proximity, Co-Prosperity Sphere, et al, experiments over these past twenty-five years. The Dark Web is an archive of activities, strategies, and tactics that we still use to survive, confront, and overcome authority. It’s a reminder of what is possible and what we have all accomplished during this turn of the century. From August 26 to Sept 2, 2016, Version Festival asks you to join our parallel network and become a node of the Lumpen Dark Web. As we celebrate twenty-five years of cultural action, we want you to browse our user history, to connect, and then to help formulate more strategies and tactics to continue hacking consensus reality. Without you, there is nothing.